Managing and building a bankroll is a critical skill for online tournament players. For new players, the best way to go about building your bankroll is to consider poker like a hobby. Think of it like golf. A round of golf on the weekend probably costs anywhere from $50 or more, depending on the caliber of course you play and how many beers you drink in the clubhouse afterwards. Skip one round a month and use that as your poker money. Maybe you go out to eat lunch with your co-workers 2-3 times a week. Instead, consider brown-bagging it four days a week, and then use the $15-20 you are saving as your poker fund. However you do it, settle on an amount that you are comfortable spending each month, and then deposit that amount into a poker account. That amount and no more. If you blow through your deposit in two weeks, just play the freerolls until it's time to make your next deposit the next month. Setting strict bankroll guidelines and then adhering to them is crucial to allow yourself time to develop as a poker player. You are more than likely going to lose your first few deposits, but as long as you are not risking more than you can afford to lose, it's okay. 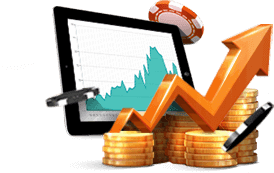 Start out at the lowest stakes you can find on your site, and don't even think about moving up to the next stake level until you have demonstrated consistently that you can win at the lowest levels. Once your ITM (In the Money) rate gets to be 20-25%, then you can consider moving up a level. One of the most common mistakes made by new players is to jump up in stakes as soon as their bankroll gets a bump. That's the worst thing you can do. Just because you made it to the final table in a multi-table tournament and earned your first big score doesn't mean you're ready for the $100 (or even $10) tourneys. You need to make sure your game is solid enough for the next level before you blow through your winnings in a couple of bad sessions. You also need to set limits on what stakes you will play. For multi-table tournaments, a sliding scale is in order. If your bankroll is less than $100, restrict the entry fees to less than 3% of your bankroll, i.e. tournaments that are $3 or less. If your bankroll is between $100 and $200 you can safely extend this to 5%, meaning you could play tourneys in the $5-$10 range. If your bankroll is over $200, then you can step up to some larger buy-ins (up to 10 percent of your bankroll, or $20). Online sites generally pay about the top 15 percent of players in a tournament, which means that on average, you would cash once in about every six or seven tournaments you play. Tournament players can go through long stretches without cashing, so your bankroll must be able to withstand these dry spells. If your game is not advanced enough to make the adjustments needed when playing with a short stack, then your best strategy is to avoid re-buy tournaments and treat them for what they are: the devil's temptation. If your bankroll is small, avoid re-buy tournaments at all costs. These tournaments have small starting stacks and an extended registration period. They usually tempt you with a cheap add-on for a larger pile of chips. In addition, they tend to feature a lot of loose play early on, as many players use the opportunity for the rebuy as an excuse to take chances. The thing to remember about these tournaments is that not all re-buys are created equal. If you pay $5 for a rebuy tournament with a starting stack of 2,000 chips and an opening big blind of 20, you are starting with 100 BBs. However, if you bust out in level 8, when the big blind is up to 200 and you decide to rebuy, you are now beginning with a starting stack of 10 BBs while the average stack for the rest of the field is probably close to double what you have. If your game is not advanced enough to make the adjustments needed when playing with a short stack, then your best strategy is to avoid re-buy tournaments and treat them for what they are: the devil's temptation. When considering which site to play at, sign-up bonuses should not be a major consideration. Why? Because tournament players usually don't generate enough rake to trigger their bonuses. Let's say a site is offering a 100% deposit bonus and you make a deposit of $100. The site awards 2 bonus points for every $1 in tournament fees (not buy-ins). So if you play a $10 tournament with a $1 fee, you have earned 2 bonus points. You would have to earn 200 bonus points to earn the entire deposit bonus, which means you'd have to play 100 $10+$1 tournaments within a short amount of time (usually 60 or 90 days). Chances are you would blow through that $100 well before you generated the $1,100 needed to activate the bonus. To give yourself the best shot at clearing a sign-up bonus, you should try to first build up a bankroll by playing freerolls. CardsChat offers some great freerolls on America's CardRoom/Black Chip Poker, PokerStars, Party Poker, 888 Poker and BetOnline. Be sure to join the Freeroll Club, sign up for those sites through the links on CardsChat, and start playing the freerolls. If you can translate your freeroll winnings into a decent size bankroll (say at least $200) before you make your first deposit, then you put in some money and start playing the higher volume and higher stakes that you would need to ever give yourself a realistic shot at earning the sign-up bonus. Learning to control your emotions is key to your ultimate success as a poker player, especially in multi-table tournaments. If you are going to lose control every time someone hits a two-outer on the river to win a hand, you are not going to have a fun, profitable poker career. If you feel tilt coming on, get up from the computer and take a self-induced break. Get a drink from the refrigerator, take out the trash, brush your teeth - some quick little chore to get your mind off the knucklehead who just called an all-in after the turn with pocket 4s and hit a set on the river. This is where your time bank can come in handy. Don't click the sit out button, just let your time bank expire. If you are deep in the tourney, you may have as much as 90 seconds or two minutes of time bank, which means you can take a 3-4 minute break and probably miss no more than two hands. When you feel settled again, sit back down and resume playing. Luck runs both ways. It is not skill when you hit a two-outer on the river, and it's not luck when your opponent does the same. It's just poker. The quicker you learn to handle your emotions after a bad beat, the more quickly you will become a profitable player, and the longer your bankroll will last.